After weeks of exploring the deep rain forest, the princess had almost given up until she saw the old cement path hidden behind a row of giant trees. She smiled in relief, it was the first sign of human life she found after she left the forest guardian's home, and the first sign of the great goddess of her tribe. "Finally... The sooner I find her, the sooner I can leave this place..." the princess said, sighing at her surroundings. She examined the path closer, past the myrid leaves and the huntu trees. 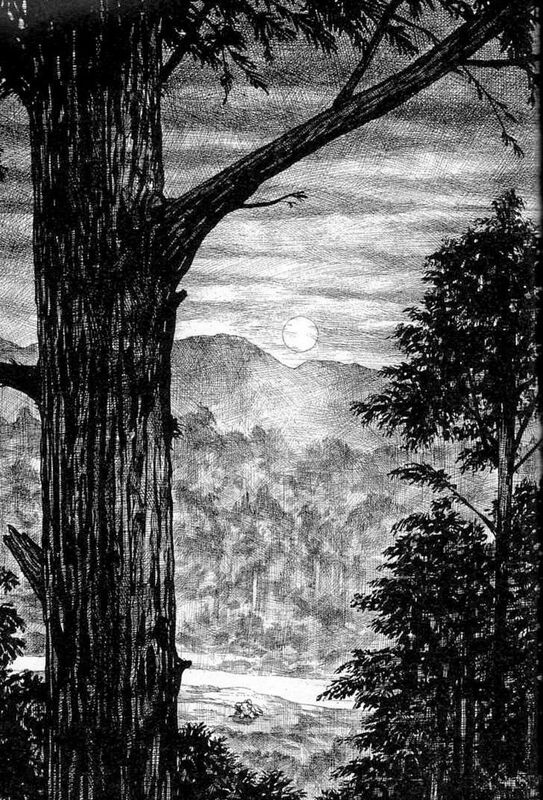 The forest itself was beautiful, the princess noted the first day she stepped inside, but dreadfully quiet. No birds sang, no wind blew and no animals lurked. She was constantly surrounded by an eerie silence. The only sounds there were were the sounds she made on her own. After only a night there, she felt like she was transported to another world. She owed it to her feline companion, a magical familiar, for her still sane mind. She had kept her company throughout the whole journey, helping her and encouraging her to keep going when she really needed it. The princess had heard stories before of the forest the goddess dwells in from her aunts and uncles, of the cursed and haunted lands. But she had never heard of meetings with the mysterious deity herself. So many had given up or gotten lost inside the forest. So far, she hadn't meant any ghosts, nor any dead bodies. But she didn't know if that would last after meeting the great goddess. She felt fear rising up inside her as she stared at the concrete path and the rusted metal railings. And she wondered to herself, _who had made this path? Where were they to tell this story? How does she know the goddess does not accept human sacrifices? "The sooner I find her, the sooner I can leave this place..." she told herself once more and stepped onto the concrete. It was then she heard something. After weeks of listening to her own footsteps on the muddy paths, she now heard another. Huge footsteps, coming slowly, one after another with great power. The princess felt her heartbeat quicken with each step. She gulped at the shadowy figure in the distance, coming closer with every thundery sound. She noticed, with shock and awe as the surrounding trees around her began to lose their colour. The greens and the browns were slowly becoming paler as the princess could now make out the shape of the shadowy figure. "Oh my..." she murmured, grabbing onto the metal railings as her legs collapsed beneath her, her fire powers drained. 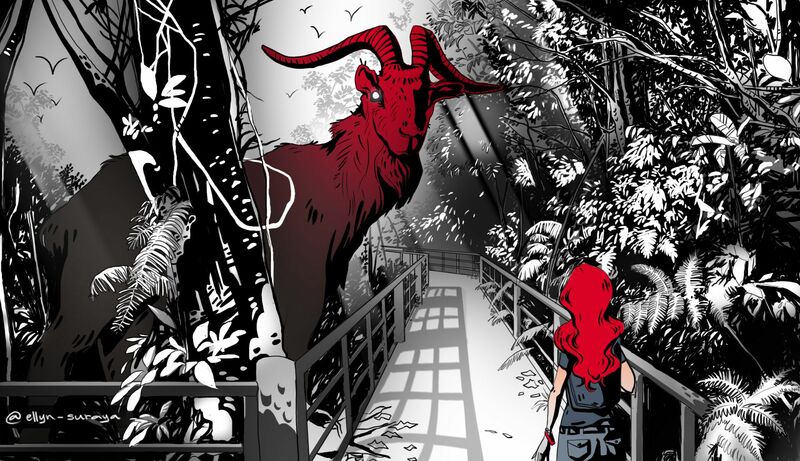 Great horns peered out of the trees before the goddess itself, towering as tall as the trees around her and red as flames, stepped forward and stopped before her. By now, the silence was deafening. I used actual pictures I found from the internet for the composition of the drawing and also reference pictures. 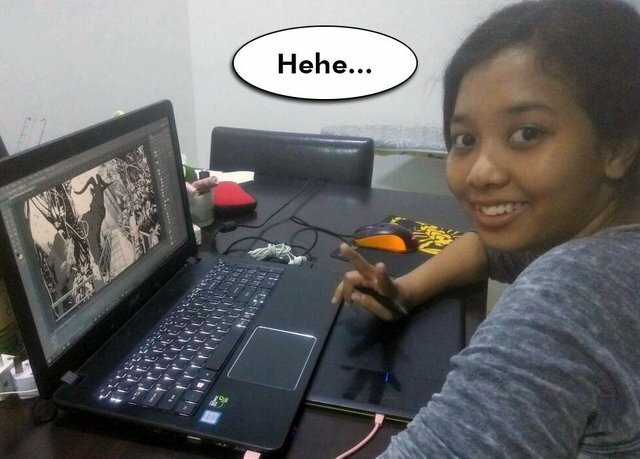 The drawing is totally digital, using Photoshop and my trusty Bamboo CTL-470 Tablet! Fun fact, the forest took hours for me to draw. I've done these sorts of forest drawings before, traditionally, and I find myself drawing much faster that way. I don't know why it took so long to do digitally! 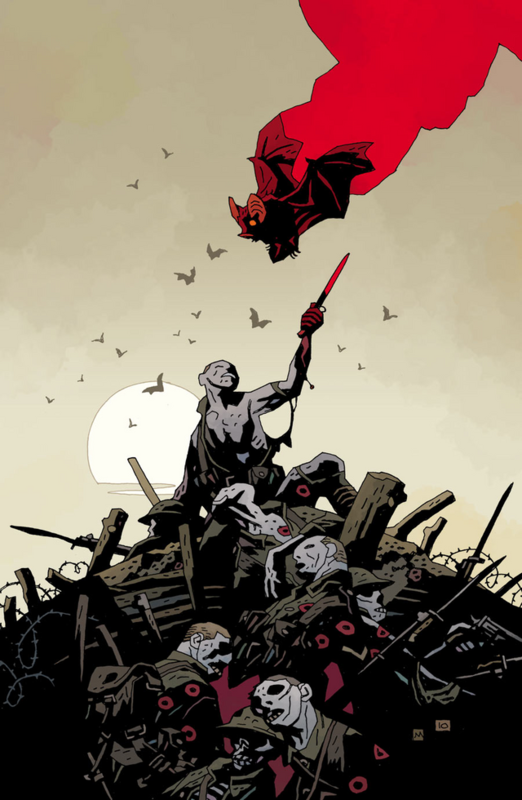 My thoughts on Mike Mignola's drawing style is that it's very intriguing, in its simple strokes and strong contrasting colours, I was amazed. Dawid Planeta's art is also very interesting! I initially planned to just draw the fire princess, but I was so inspired by his artworks that I couldn't help but mash up the two styles together! And this is me, sore back and smiling at how satisfied I am with this piece :) ... 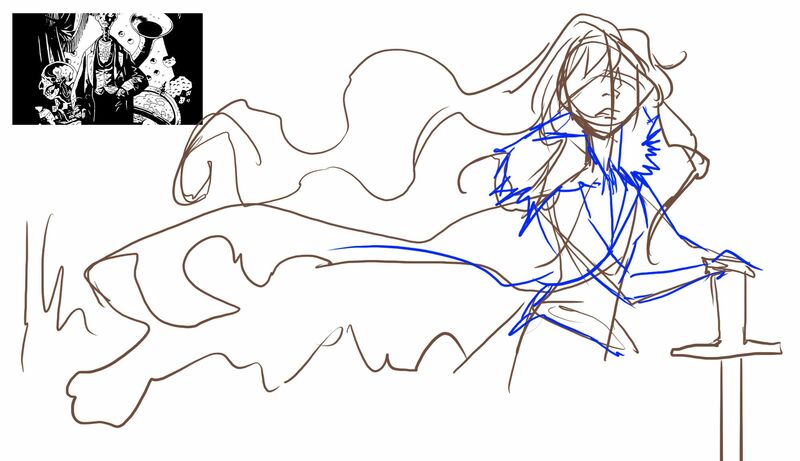 I usually draw just characters like my fire princess sketch, so this was a nice change for me. Thank you for supporting Steem-cartoon and myself!!! wow this is some really refreshing style. Love it! Wooow, Im simply amazed by level of detalis. I just love it. I had a similar tablet and I wish I was half as decent with it as you are. Shows you it's the artist that makes the piece not the tool. Props all around + Followed! Nice work ellyn..love the detail you put in there..
Congratulations @ellyn-suraya! You received a personal award!